Believe it or not, you don’t need 16 tabs open to keep track of all of your email accounts and stay productive. In fact, we would like to banish that logic entirely (read: mo’ tabs, mo’ probems!). Stop wasting precious time and slowing your computer down with multiple browsers open. Close ‘em up to streamline your workflow, and increase efficiency! And we’re not talking about your desk drawer (...but you can do that too!). Get that ‘take on the world and anything throws at me’ feeling of a Spring clean by simply organizing your desktop computer and deleting all of the extras that pile up (hint: we are talking to all of you ‘save to Desktop’ people!). We live in a world full of distractions, and it can be hard to keep up with what matters when you feel bombarded, all hours of the day. Prioritize your inboxes and decide which ones need to be checked most(or least!) frequently. Create a schedule you can stick to, then stick to it. We know, it’s tempting to head back into your email every few minutes, especially if you’re procrastinating about that report you need to get done. Most of us have a bit of a love/hate relationship with email and the curiosity that drives us back in there far too often. We suggest you set up desktop notifications to keep an ‘eye’ on things without getting distracted. 5. Stop browser over-usage, once and for all!. It’s time to rethink the way you work on your desktop, and focus in with applications that help streamline your workflow. We all do this without thinking on our mobile devices; why not the same on our desktop computers? Your browser is tired and Shift awaits. 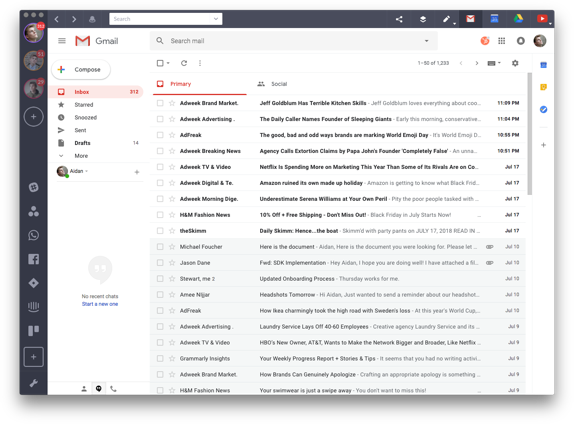 Get your workflow, and mostly your email, under control with one simple and beautiful solution. It’s as dreamy as it sounds!